I love when I can find recipes I remember from my childhood and adapt them so I can eat them again. My mom used to make rice pudding (two ways - this method, stovetop, and baked: the same ingredients but mixed together cold and baked so the top gets crispy), and I recently recreated her classic recipe with the "real food" basic ingredients we eat now (also dairy free). I also did some Googling for a classic stovetop rice pudding recipe (looked at a couple of Martha's, of course) and while there are millions of ways to make it (most of them with approximately the same ingredient list) and I'm sure they're all delicious, some were easier than others. I'm a one-pan kind of cook for desserts, and some of them were way too involved for the quick make-it-while-also-making-dinner kind of recipe I was looking for. So I put together this easy version with great success. Pretty sure my mom used to make it in a pretty low-maintenance way, too. I wasn't sure how it would turn out with almond or coconut milk instead of cow's milk, and sweetened with something other than white cane sugar, but it was great! I've made it twice now, lightly sweetened and with raisins on top just like I remember, and it's been the perfect post-workout treat. I'm happy to say I've become able to eat rice again recently. We've been Paleo since Christmas 2012, and when we first made the switch and went completely grain-free, when I tried rice a few times I didn't have a good reaction. But recently I've tried again, and it seems the 1.5+ years of gut healing I've been doing on this nutrient-dense, low-inflammation, low-antinutrient diet has strengthened my digestive system so I now can eat some white rice every once in a while! (And yes, it's actually "healthier" and easier to digest to use white rice instead of brown - some quick articles about that on Holistic Squid here and on my husband's blog here.) I've also dramatically improved my thyroid function over the past year, so I'm not as worried about autoimmune response from the smaller amount of lectins in white rice. So this recipe is great as a post-workout treat (carbs primarily from glucose rather than fructose, advisable in carb loading to restore muscle glycogen). How "bad" or "not Paleo" is rice? Put water, 1 cup almond or coconut milk, and rice into small saucepan. Bring to an almost-boil then turn down to low and cover; cook for about 15 minutes. Uncover and increase heat to medium to allow some of the moisture to evaporate. Add salt, sweetener of choice, raisins, and butter. Stir. Mix remaining 1 cup almond or coconut milk with egg and whisk. Turn heat in saucepan back to low and slowly add the egg/milk blend to the pan and stir. Cook for another 3 or so minutes while pudding thickens. Turn off heat and stir in vanilla. Let cool for 5-10 minutes before serving. Sprinkle with cinnamon and serve! So satisfying and comforting, without being overly sweet or complicated. It even impressed my wary-of-new-things husband. He's also not a big fan of raisins but he loved this pudding and requested it again! Yum. 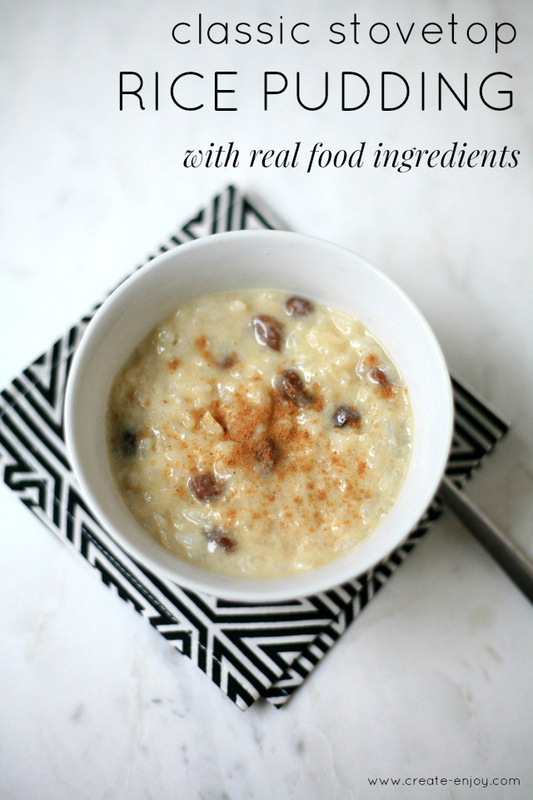 I admit I always thought rice pudding was a little weird until last year and now I'm really hooked on it. That sounds like a great post-workout snack! Sounds delicious. I'm with Kelsey - adore those bowls, too! I'm really intrigued... we fell in love with Mango Sticky Rice which is kind of like Thai rice pudding, so I think I might enjoy this. Also, I never new white rice might be easier to digest than brown rice. Good to know! Rice pudding is probably one of my favorite dessert. However I only tried to make it myself once and it didn't turn so great. Maybe I'll give a shot to your recipe since the pictures look so tasty! Plus, I loved the "real food ingredients" mention :) Exactly what I'm looking for! This looks delicious! Rice pudding is something my husband ate frequently as a child, so I might try this as a treat for him. Thanks! Hope you try it and it's awesome! Haha! Yeah it's kind of old-fashioned. But great! Haha, it is grandma-ish!! Love it though! Rice pudding is one of those foods that wraps itself around you and says, "You are loved." I haven't made it in some time - thanks for the reminder. P.S. It rocks with Craisins (says the girl who hates raisins). Ooh, that sounds delicious! You're right, it is very comforting! I would love to try this recipe, but I'm not really into milk substitutes. Do you think regular cows milk with the same measurement will work fine? Probably! I used pretty close to the same proportions of everything from the traditional recipes I modeled from. Glad you tried and liked it!! Good question. I can tolerate butter and ghee because they're mostly milk fat, not milk protein (casein) or sugar (lactose), which I sometimes have reactions to. You might like it better with white rice instead of brown! Did you see all my links above about the benefits of white? Like this http://holisticsquid.com/is-white-rice-bad-for-you/ and this http://www.grassfedgeek.net/2013/11/why-i-eat-white-rice-instead-of-brown.html. Thanks for the update and feedback, glad you liked it!! I did check out your links. I did not know that about brown rice! We are brown rice devotees currently and stopped buying all white pasta and rice a while ago. We have been transitioning to buying only organic fruit and veggies. I am learning so much just by actually thinking about where our food really comes from. Thanks for the food for thought (pun intended).